MANILA, Philippines - Contrary to some reports that a super-typhoon is coming this week, state weather bureau PAGASA on Tuesday, December 3, 2014 said that 'Bagyong Ruby' (international name: Hagupit) will not be a Yolanda-level typhoon. PAGASA deputy administrator Jun Dalida assured that 'Hagupit' though shaping up to be a very strong typhoon is not expected to become a super typhoon. He said that super typhoons are over 200 kph. In comparison, Typhoon Yolanda which hit the central Philippines on November 8 has a recorded maximum sustained winds of 314 kph when it made landfall. In a weather update released on Tuesday as of 5:30p.m., tropical storm 'Hagupit' was estimated based on all available data at 2,265 km east of Mindanao (6.0°N, 144.5°E). 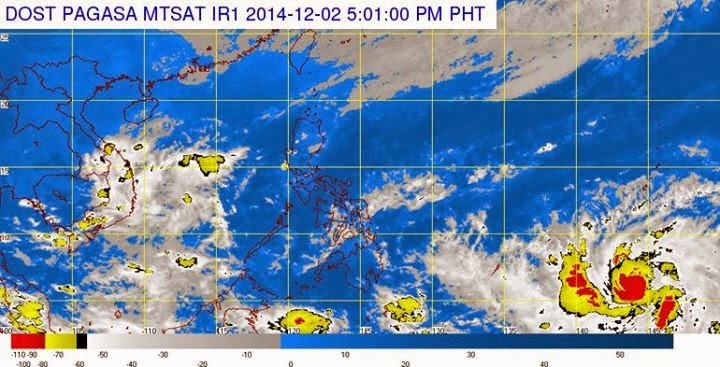 'Hagupit' has a maximum sustained winds of 75kph near the center and gustiness of up to 90kph. It is forecast to move west northwest at 35kph. PAGASA advised that it is still too far to affect any part of the country. It is expected to enter the Philippine Area of Responsibility (PAR) on Thursday morning. The weather bureau also gave updates using JTWC reference model and says that it may reach (as high as) 180 kph. If Hagupit continues in this way, it is forecast to make landfall on Sunday in Bicol, eastern Visayas, or CARAGA. PAGASA warned of possible storm surges three to four meters high in some areas. PAGASA said there are 2 possible scenarios of the tropical storm: 1) will landfall in Eastern Visayas or 2) will not landfall, instead it will recurve towards Southern Japan. The Northeast Monsoon or "Amihan" will bring cloudy skies with light to moderate rains over cagayan valley and over the provinces of apayao and ilocos norte. Meanwhile, Metro Manila , CALABARZON and Aurora will experience cloudy skies with light to moderate rainshowers and thunderstorms. The rest of the country will be partly cloudy to cloudy with isolated rainshowers or thunderstorms. This weather scenario will persist until Thursday (December 4). By Friday (December 5), the "Amihan" will continue to bring light rains over cagayan valley and over the provinces of Apayao and Ilocos Norte. The outer cloud bands of the Tropical Cyclone on the other hand, will bring cloudy skies and light to moderate rainshowers and thunderstorms over the Bicol Region and over the province of Quezon including Polillo Islands. Metro Manila and the rest of the archipelago will be partly cloudy to cloudy with isolated rainshowers or thunderstorms.